They have also released 1:72 Comanche (7216) and Apache (7248) kits that I assume are derived the Italeri versions. Initial reports on the Merlin are very favourable. It comes with markings for three current RAF Benson 28 Sqn. aircraft, ZJ123/G, ZJ125/J and ZJ126/K, and one from 72 Sqn. at DERA Boscombe Down in July 2000, ZJ118. 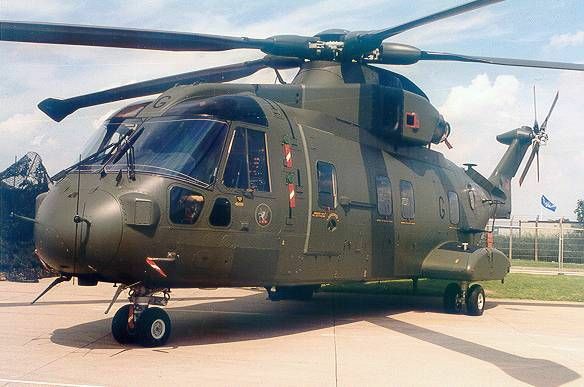 It has two of the same sprues as the Italeri kit, with the third containing a new mid-tail section (with rear loading ramp), new fuselage side panels, 12 cabin seats with moulded belts, sponsons with chaff dispensers, a new nose with the FLIR turret and various cable cutters, IFR probes and antenna, and a re-fueling boom. The clear sprue has additional bubble windows and two extra flat ones. The rotorblade cuff shrouds that were missing from the Italeri kit are also provided. The paint-mixing instructions are predictably annoying and useless. There is also a rumour of interior & exterior 1:35 UH-60 sets for next month. 5. In Japan, Birdman have also released a set of 1:48 AH-64D Longbow canopy masks, #H4802. 6. Mach 2 have announced their intention to release a 1:72 Kaman HH-43 Huskie. 7. MPD Decals have issued #72603 for the Mil Mi-17 Hip. 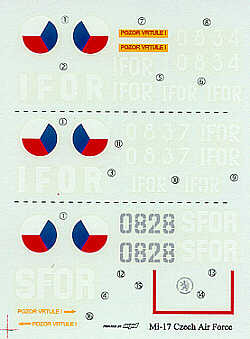 This has markings for three Czech Air Force aircraft; white 0834 and white 0837, both IFOR, and grey 0828, SFOR. 8. Squadron/Signal's Walk-Around #5529, the AH-1 Cobra by Wayne Mutza, is due in May. 9. Model Alliance decals and conversions are now being stocked in Canada by Flightdecs. 10. Legato have now released #00372, a 1:72 resin PZL W-3A Sokol. 11. Battle Axe have now released #4806, their 1:48 Piasecki HUP-2. 12. Due from Fujimi in April is their 1:72 Blackhawk with UH-60J Komatsu Base 40th Anniversary special markings, #72134. 13. In the last edition of 'Steelmasters' (an AFV model magazine) it said that Panda Models of Shanghai will release a 1:35 CH-47 Chinook in a variety of models including CH-47A/B, CH-47D, and MH-47J. 14. Trumpeter's 1:48 Harbin Z-9G and HH-65A Dolphin are expected to be available in 3 to 4 weeks time. In addition to these two kits there will also be a special edition French Navy Dauphin, thought to be available only in France. Thanks to Jan Goos, David Nilson, Roger Marriott, and Philippe Dognon.